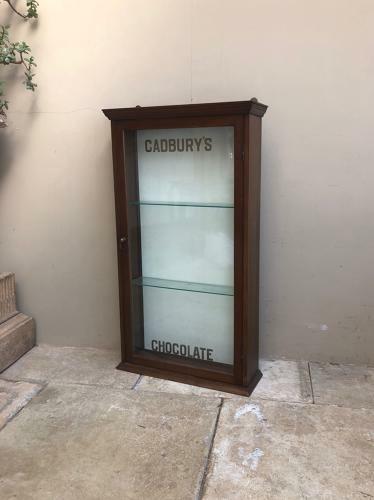 A very RARE 1940s Cadburys Chocolate Shops Advertising Cupboard. Rare as it wall hangs...most of the Cadburys Advertising Cupboards are Counter Top ones which open from the back. This because it wall hangs and the door opens from the front can be used to display items and use as a normal cupboard. Wonderful Original Condition...with removeable glass shelves. On the backing boards "THIS SHOWCASE IS THE PROPERTY OF CADBURY BROTHERS LTD. BOURNVILLE" There are hinges on the top ready to wall hang. Everything in very good order and there is no worm. Has to be collected or Sent by Courier UK £55 (Not including Scotland).